Global warming has melted the great ice sheets. No Polar caps remain. The oceans are free. Icebergs are only a memory. The waters have risen more than 80 meters. Gone are the magnificent harbours that once dotted the shores of every land. But land is everything! Millions are starving. Fertile plains are no more. The great grain belts of the world have been tightened. Tension runs high yet there is hope. There is a new continent to explore and cultivate. But who will lay claim to this new land? Four rallying hosts prepare in haste. One dominion can save but a few ... the race is on. Armies are raised with every man coming forth. Unite and fight ... conquer or be lost. Combine your forces, assemble your fleets and breach the storms. Clouds clear for one last stand. The prize is yours ... Antarctica! 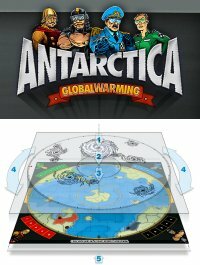 Antarctica Global WARming is a new game from the father and son team of Peter and Frank Zuuring, at Savita Games. This futuristic game of global survival features an innovative rotating weather map, which allows storms to move around the game board affecting game pieces with a roll of a dice. If you're a fan of strategy games such as Risk, or are interested in the possible effects of global warming, you'll probably enjoy this game. Now that Antarctica is free of the ice that has trapped it for millions of years, it's a whole new world to explore and conquer! Note: This is an archive post; it was originally published on May 19, 2006.